Is Fitbit Stock (NYSE: FIT) at the Mercy of the Apple Watch? Subject: Is Fitbit Stock (NYSE: FIT) at the Mercy of the Apple Watch? The Fitbit stock price has seen a massive lift over the last week. Fitbit Inc. (NYSE: FIT) stock has leaped 9.1% since Sept. 3. Shares of the fitness-related wearable tech company surged 13% on Tuesday after Morgan Stanley (NYSE: MS) upgraded Fitbit stock to a "Buy" rating. The bank cited the firm's massive market share over Apple Inc. (Nasdaq: AAPL) in the wearable tech industry as the reason why the Fitbit stock price will see long-term appreciation. Morgan Stanley's rating came after research showed a shrinking customer base for the Apple Watch. 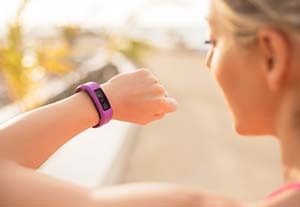 According to the bank's AlphaWise survey, consumer purchase intention – which measures a person's favorability toward competing products – of Fitbit trackers rose from 15% in May to 17% in July. Meanwhile, the Apple Watch's consumer purchase intention decreased to 20% over the same period. "We see less Apple Watch cannibalization risk," Morgan Stanley analyst Katy Huberty wrote to investors Tuesday. "Fitbit's leadership in a large ($10B) and fast growth market merits a high valuation." While many investors expected the Apple Watch to run Fitbit out of business, the opposite has happened. In fact, Fitbit's sales only dipped during the months leading up to the Apple Watch's April 24 release. According to Bloomberg, Fitbit products have outsold Apple Watches since May. Fitbit sold 4.5 million devices in the second quarter, up 162% from the year-ago period. Research firm IDC said Apple only sold 3.6 million watches in the second quarter. Apple stock has also been struggling, down 8% in the last month. It slumped another 2% yesterday after the company held a huge unveiling event for a new line of products. Fitbit clearly has the edge on Apple in the wearable tech market. But that doesn't necessarily mean you should dump your money into Fitbit stock right away. Questions about Fitbit stock or the tech sector? Talk to us on Twitter at @moneymorning.